Le Morte d'Arthur (originally spelled Le Morte Darthur, Middle French for "The Death of Arthur") is a reworking by Sir Thomas Malory of existing tales about the legendary King Arthur, Guinevere, Lancelot, Merlin, and the Knights of the Round Table. Malory interpreted existing French and English stories about these figures and added original material (e.g., the Gareth story). Malory's actual title for the work was The Whole Book of King Arthur and His Noble Knights of the Round Table (The Hoole Book of Kyng Arthur and of His Noble Knyghtes of The Rounde Table), but after Malory's death the publisher changed the title to that commonly known today, which originally only referred to the final volume of the work. Le Morte d'Arthur was first published in 1485 by William Caxton and is today one of the best-known works of Arthurian literature in English. Until the discovery of the Winchester Manuscript in 1934, the 1485 edition was considered the earliest known text of Le Morte d'Arthur and that closest to Malory's translation and compilation. Modern editions are inevitably variable, changing spelling, grammar and pronouns for the convenience of readers of modern English. Many modern Arthurian writers have used Malory as their principal source. The exact identity of the author of Le Morte d'Arthur has long been the subject of speculation, owing to the fact that at least six historical figures bore the name of "Sir Thomas Malory" in the late 15th century. In the work the author describes himself as "Knyght presoner Thomas Malleorre" ("Sir Thomas Maleore" according to the publisher William Caxton). This is taken as supporting evidence for the identification most widely accepted by scholars: that the author was the Thomas Malory born in the year 1416, to Sir John Malory of Newbold Revel, Warwickshire, England. Sir Thomas inherited the family estate in 1434, but by 1450 he was fully engaged in a life of crime. As early as 1433 he had been accused of theft, but the more serious allegations against him included that of the attempted murder of Humphrey Stafford, 1st Duke of Buckingham, an accusation of at least two rapes, and that he had attacked and robbed Coombe Abbey. Malory was first arrested and imprisoned in 1451 for the ambush of Buckingham, but was released early in 1452. By March he was back in the Marshalsea prison and then in Colchester, escaping on multiple occasions. In 1461 he was granted a pardon by King Henry VI, returning to live at his estate. Although originally allied to the House of York, after his release Malory changed his allegiance to the House of Lancaster. This led to him being imprisoned yet again in 1468 when he led an ill-fated plot to overthrow King Edward IV. It was during this final stint at Newgate Prison in London that he is believed to have written Le Morte d'Arthur. Malory was released in October 1470, when Henry VI came to the throne, but died only five months later. Elizabeth Bryan speaks of Malory's contribution to Arthurian legend in her introduction to Le Morte d'Arthur: "Malory did not invent the stories in this collection; he translated and compiled them... Malory in fact translated Arthurian stories that already existed in 13th-century French prose (the so-called Old French Vulgate romances) and compiled them together with at least one tale from Middle English sources (the Alliterative Morte Arthure and the Stanzaic Morte Arthur) to create this text." Malory called the full work The Hoole Book of Kyng Arthur and of His Noble Knyghtes of The Rounde Table, but William Caxton instead titled it with Malory's name for the final section of the cycle. The Middle English of Le Morte d'Arthur is much closer to Early Modern English than the Middle English of Geoffrey Chaucer's Canterbury Tales. If the spelling is modernized, it reads almost like Elizabethan English. The publication of Chaucer's work by Caxton was a precursor to his publication of Malory's Le Morte d'Arthur. Where the Canterbury Tales are in Middle English, Malory extends "one hand to Chaucer, and one to Spenser" constructing a manuscript which is hard to place in one category. 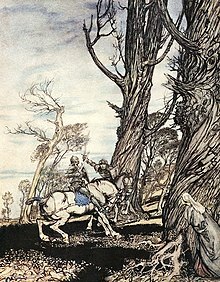 Like other English prose in the 15th century, Le Morte d'Arthur was highly influenced by French writings, but Malory blends these with other English verse and prose forms. Caxton separated Malory's eight books into 21 books; subdivided the books into a total of 507 chapters; added a summary of each chapter and added a colophon to the entire book. The first printing of Malory's work was made by William Caxton in 1485. Only two copies of this original printing are known to exist, in the collections of the Morgan Library & Museum in New York and the John Rylands Library in Manchester. It proved popular and was reprinted in 1498 and 1529 with some additions and changes by Wynkyn de Worde who succeeded Caxton's press. Three more editions were published before the English Civil War: William Copland's (1557), Thomas East's (1585), and William Stansby's (1634), each of which contained additional changes and errors (including the omission of an entire leaf). Thereafter, the book went out of fashion until the Romantic revival of interest in all things medieval. Winchester College headmaster W. F. Oakeshott discovered a previously unknown manuscript copy of the work in June 1934, during the cataloging of the college's library. Newspaper accounts announced that what Caxton had published in 1485 was not exactly what Malory had written. Oakeshott published "The Finding of the Manuscript" in 1963, chronicling the initial event and his realization that "this indeed was Malory," with "startling evidence of revision" in the Caxton edition. Malory scholar Eugène Vinaver examined the manuscript shortly after its discovery. Oakeshott was encouraged to produce an edition himself, but he ceded the project to Vinaver. Based on his initial study of the manuscript, Oakeshott concluded in 1935 that the copy from which Caxton printed his edition "was already subdivided into books and sections." Vinaver made an exhaustive comparison of the manuscript with Caxton's edition and reached similar conclusions. In his 1947 publication of The Works of Sir Thomas Malory, he argued that Malory wrote not a single book, but rather a series of Arthurian tales, each of which is an internally consistent and independent work. However, William Matthews pointed out that Malory's later tales make frequent references back to the earlier events, suggesting that he had wanted the tales to cohere better but had not sufficiently revised the whole text to achieve this. Microscopic examination revealed that ink smudges on the Winchester manuscript are offsets of newly printed pages set in Caxton's own font, which indicates that the Winchester Manuscript was in Caxton's print shop. The manuscript is believed to be closer on the whole to Malory's original and does not have the book and chapter divisions for which Caxton takes credit in his preface. The manuscript has been digitised by a Japanese team, who note that "the text is imperfect, as the manuscript lacks the first and last quires and few leaves. The most striking feature of the manuscript is the extensive use of red ink." Because there is so much lengthy ground to cover, Malory uses "so—and—then," often to transition his retelling. This repetition is not redundant, but adds an air of continuity befitting the story's scale and grandeur. The stories then become episodes instead of instances that can stand on their own. As noted by Ian Scott-Kilvert, the forms of romantic characters used in order to create the world of Arthur and his knight "consist almost entirely of fighting men, their wives or mistresses, with an occasional clerk or an enchanter, a fairy or a fiend, a giant or a dwarf," and "time does not work on the heroes of Malory." Arthur is born to Uther Pendragon and Igraine and then taken by Sir Ector to be fostered in the country. He later becomes the king of a leaderless Britain when he removes the fated sword from the stone. Arthur goes on to win many battles against rivals and rebels due to his military prowess and the prophetic and magical counsel of Merlin (later replaced by Nimue), further helped by the sword Excalibur. The first book also tells "The Tale of Balyn and Balan", of the treason of Arthur's sister Morgan le Fay, and of the begetting of Mordred, Arthur's incestuous son by one of his other sisters, Morgause (though Arthur did not know her as his sister). On Merlin's advice, Arthur takes every newborn boy in his kingdom and all but Mordred, who miraculously survives and eventually indeed kills his father, perish at sea (this is mentioned matter-of-fact, with no apparent moral overtone). Arthur marries Guinevere, and inherits the Round Table from her father Leodegrance. He then gathers his chief knights, including some of his former enemies, at Camelot and establishes the Round Table fellowship as all swear to the Pentecostal Oath as a guide for knightly conduct. In this first book, Malory addresses 15th-century preoccupations with legitimacy and societal unrest, which will appear throughout the rest of the work. According to Helen Cooper in Sir Thomas Malory: Le Morte D'arthur - The Winchester Manuscript, the prose style, which mimics historical documents of the time, lends an air of authority to the whole work. This allowed contemporaries to read the book as a history rather than as a work of fiction, therefore making it a model of order for Malory's violent and chaotic times during the Wars of the Roses. Malory's concern with legitimacy reflects the concerns of 15th-century England, where many were claiming their rights to power through violence and bloodshed. This book, detailing Arthur's march on Rome, is based mostly on the Middle English Alliterative Morte Arthure, which in turn was heavily based on Geoffrey of Monmouth's Historia Regum Britanniae. The opening of Book V finds Arthur and his kingdom without an enemy. His throne is secure and his knights including Gawain have proven themselves through a series of battles and quests. Seeking more glory, Arthur and his knights then go to the war against (fictitious) Emperor Lucius who demanded Britain to resume paying tribute. After defeating the Romans and killing Lucius, Arthur is crowned a Roman emperor but instead returns to Britain. In this tale, based on the French Prose Lancelot, Malory establishes Sir Lancelot as King Arthur's most revered knight through numerous episodic adventures. Lancelot always adheres to the Pentecostal Oath, assisting ladies in distress and giving mercy for honorable enemies he has defeated in battle. However, the world Lancelot lives in is too complicated for simple mandates and, although Lancelot aspires to live by an ethical code, the actions of others make it difficult. Other issues are demonstrated when Morgan le Fay enchants Lancelot, which reflects a feminization of magic, and in how the tournament fighting in this tale indicates a shift away from warfare towards a more mediated and virtuous form of violence. Malory also attempts to shift the focus of courtly love from adultery to service by having Lancelot admit to doing everything he does for Guinevere, but never admit to having an adulterous relationship with her. A short part that primarily deals with the adventures of the young Sir Gareth in his chivalric quest for Lynette and Lioness. The tales of Sir Tristan of Lyonesse, Sir Dinadan, Sir Palamedes, Sir Alexander the Orphan, "La Cote de Male Tayle", and a variety of other knights. Based on the French Prose Tristan, or a lost English adaptation of it, Malory's Tristan section is the literal centerpiece of Le Morte d'Arthur as well as the longest of the eight books. Tristan is the namesake of the book and his adulterous relationship with the Belle Isolde, his uncle King Mark's wife, is one of the focuses of the section. Various knights, even those of the Round Table, make requests that show the dark side of the world of chivalry. It also includes the story of Lancelot fathering Sir Galahad by Elaine of Corbenic. Malory's primary source for this long part was the French La Queste del Saint Graal. 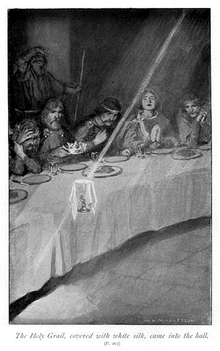 Malory's version chronicles the adventures of many knights in their quest to achieve the Holy Grail, which first miraculously appears to them at the Round Table. Gawain is the first to embark on the quest for the Grail. Other knights like Lancelot, Percival, and Bors, likewise undergo the quest, eventually achieved by Galahad. Their exploits are intermingled with encounters with maidens and hermits who offer advice and interpret dreams along the way. After the confusion of the secular moral code he manifested within the previous book, Malory attempts to construct a new mode of chivalry by placing an emphasis on religion. Christianity and the Church offer a venue through which the Pentecostal Oath can be upheld, whereas the strict moral code imposed by religion foreshadows almost certain failure on the part of the knights. For example, Gawain is often dubbed a secular knight, as he refuses to do penance for his sins, claiming the tribulations that coexist with knighthood as a sort of secular penance. Likewise, Lancelot, for all his sincerity, is unable to completely escape his adulterous love of Guinevere, and is thus destined to fail where Galahad will succeed. This coincides with the personification of perfection in the form of Galahad. Because Galahad is the only knight who lives entirely without sin, this leaves both the audience and the other knights with a model of perfection that seemingly cannot be emulated either through chivalry. The book is dedicated to the story of Lancelot and Queen Guinevere's adulterous romance, including his rescue of her from the abduction by Maleagant. Writing this part, Malory used the version of Arthur's death originating from the French Mort Artu. Mordred and Agravaine finally reveal Guinevere's adultery and Arthur sentences her to burn. Lancelot's rescue party raids the execution, killing many knights including Gawain's brothers Gareth and Gaheris. Gawain, bent on revenge, prompts Arthur into a war with Lancelot. After they leave to pursue Lancelot in France, Mordred seizes the throne and takes control of Arthur's kingdom. At the bloody Battle of Camlann between Mordred's followers and Arthur's loyalists, Arthur kills Mordred but is himself mortally injured. As Arthur is dying, the lone survivor Bedivere casts away Excalibur and a barge carrying Morgan and Nimue appears to take Arthur to Avalon. After the passing of King Arthur, Malory provides a denouement, mostly following the lives (and deaths) of Bedivere, Guinevere, Lancelot, and Lancelot's kinsmen. Arthur's appointed successor is Constantine, son of King Carados of Scotland, and the realm that Arthur created is significantly changed. Doo after the good and leve the evyl, and it shal brynge you to good fame and renomme. Do after the good and leave the evil, and it shall bring you to good fame and renown. James Thomas Knowles published it as The Legends of King Arthur and His Knights in 1860. It has been subsequently illustrated by William Henry Margetson. In 1880, Sidney Lanier published a much watered-down and expurgated version of Malory's book titled The Boy's King Arthur: Sir Thomas Malory's History of King Arthur and His Knights of the Round Table, Edited for Boys. This version was later incorporated into Grosset and Dunlap's series of books called the Illustrated Junior Library, and reprinted under the title King Arthur and his Knights of the Round Table (1950). An American edition with illustrations by N. C. Wyeth was published in 1922. The Victorian poet Alfred, Lord Tennyson retold the legends in the poetry volume Idylls of the King (1859 and 1885). His work focuses primarily on Le Morte d'Arthur and the Mabinogion, but with many expansions, additions, and several adaptations, like the fate of Guinevere. In Malory, she is sentenced to be burnt at the stake but is rescued by Lancelot; in the Idylls Guinevere flees to a convent, is forgiven by Arthur, repents, and serves in the convent until she dies. In 1892, London publisher J. M. Dent & Co. decided to produce an illustrated edition of Le Morte Darthur in modern spelling. They chose a 20-year-old insurance-office clerk and art student, Aubrey Beardsley, to illustrate the work. It was issued in 12 parts between June 1893 and mid-1894, and met with only modest success at the time. However, it has since been described as Beardsley's first masterpiece, launching what has come to be known as the "Beardsley look". It was his first major commission, and included nearly 585 chapter openings, borders, initials, ornaments and full- or double-page illustrations. Most of the Dent edition illustrations were reprinted by Dover Publications, New York, in 1972 under the title Beardsley's Illustrations for Le Morte Darthur. A facsimile of the Beardsley edition, complete with Malory's unabridged text, was published in the 1990s. Howard Pyle both wrote and illustrated his series of books: The Story of King Arthur and His Knights (1903), The Story of the Champions of the Round Table (1905), The Story of Sir Launcelot and His Companions (1907), and The Story of the Grail and the Passing of King Arthur (1910). Instead of just retelling the stories, Pyle came up with new versions of the stories, using other stories and his own imagination to embellish the tales. Beatrice Clay both wrote and illustrated her retelling, published originally as Stories from Le Morte Darthur and the Mabinogion in 1901 and later as Stories of King Arthur and the Round Table in 1905. 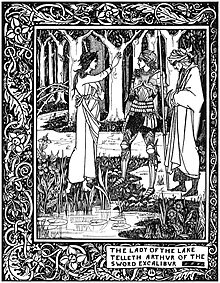 Andrew Lang (text) and Henry Justice Ford (illustrations) published Tales of King Arthur and the Round Table in 1909. King Arthur's Knights: The Tales Retold for Boys and Girls, written by Henry Gilbert and illustrated by Walter Crane, was published in 1911. T. H. White's series The Once and Future King (1938-1977) is a well known and influential retelling of Malory's story. White rewrote the story extensively in his own fashion. Roger Lancelyn and Richard Lancelyn Green published King Arthur and His Knights of the Round Table in 1953. Keith Baines published a modernized English version in 1962 as Malory's Le Morte d'Arthur. John Steinbeck utilized the Winchester Manuscripts of Thomas Malory and other sources as the original text for his The Acts of King Arthur and His Noble Knights, which he intended for young people but never completed. It was published posthumously in 1976 in unfinished form of The Book of King Arthur and His Noble Knights of the Round Table. Emma Gelders Sterne, Barbara Lindsay, Gustaf Tenggren and Mary Pope Osborne published King Arthur and the Knights of the Round Table in 2002. Excalibur, a 1981 British epic fantasy film directed, produced, and co-written by John Boorman, which retells Le Morte d'Arthur with some changes to the plot and fate of the characters (such as completely replacing Morgause with Morgan, who dies in this version). Castle Freeman, Jr.'s 2008 novel Go with Me is a modern retelling of Malory's Tale of Sir Gareth. Dorsey Armstrong published a Modern English translation that focused on the Winchester manuscript rather than the Caxton edition in 2009. Jeffrey Wikstrom humorously dissected Le Morte d'Arthur in his 2014 book series Arthur Dies at the End. Malory, Sir Thomas. The Winchester Malory: A Facsimile. Introduced by Ker, N. R. (1976). London: Early English Text Society. ISBN 0-19-722404-0. _________. The Works of Sir Thomas Malory. Ed. Vinaver, Eugène. 3rd ed. Field, Rev. P. J. C. (1990). 3 vol. Oxford: Oxford University Press. ISBN 0-19-812344-2, ISBN 0-19-812345-0, ISBN 0-19-812346-9. _________. Malory: Complete Works. Ed. Vinaver, Eugène (1977). Oxford: Oxford University Press. ISBN 0-19-281217-3. (Revision and retitling of Malory: Works of 1971). _________. Malory: Works. Ed. Vinaver, Eugène (1971). 2nd ed. Oxford: Oxford University Press. ISBN 0-19-254163-3. _________. The Works of Sir Thomas Malory. Ed. Vinaver, Eugène (1967). 2nd ed. 3 vol. Oxford: Clarendon Press. ISBN 0-19-811838-4. _________. The Works of Sir Thomas Malory. Ed. Vinaver, Eugène (1947). 3 vol. Oxford: Clarendon Press. Malory, Sir Thomas. Malory's Le Morte D'Arthur: King Arthur and Legends of the Round Table. Trans. and abridged by Baines, Keith (1983). New York: Bramhall House. ISBN 0-517-02060-2. Reissued by Signet (2001). ISBN 0-451-52816-6. _________. Le Morte D'Arthur. (London Medieval & Renaissance Ser.) Trans. Lumiansky, Robert M. (1982). New York: Charles Scribner's Sons. ISBN 0-684-17673-4. Steinbeck, John, and Thomas Malory. The Acts of King Arthur and His Noble Knights: From the Winchester Manuscripts of Thomas Malory and Other Sources. (1976) New York: Noonday Press. Reissued 1993. ISBN 0-374-52378-9. Armstrong, Dorsey. Sir Thomas Malory's Morte Darthur: A New Modern English Translation Based on the Winchester Manuscript (Renaissance and Medieval Studies) Anderson, SC: Parlor Press, 2009. ISBN 1-60235-103-1. Malory, Sir Thomas. Le Morte d'Arthur, printed by William Caxton, 1485. Ed. Needham, Paul (1976). London. Malory, Sir Thomas. Caxton's Malory. Ed. Spisak, James. W. (1983). 2 vol. boxed. Berkeley and Los Angeles: University of California Press. ISBN 0-520-03825-8. University of Michigan: Corpus of Middle English Prose and Verse: Le Morte Darthur. _________. Tales of King Arthur and the Knights of the Round Table. Caxton's text, with illustrations by Aubrey Beardsley and a foreword by Sarah Peverley (2017). Flame Tree Publishing. ISBN 978-1786645517. _________. Le Morte d'Arthur. Ed. Cowen, Janet (1970). Introduction by Lawlor, John. 2 vols. London: Penguin. ISBN 0-14-043043-1, ISBN 0-14-043044-X. _________. Le Morte Darthur. Ed. Simmon, F. J. (1893–94). Illustrated by Beardsley, Aubrey. 2 vol. London: Dent. Malory's Morte d'Arthur and Style of the Morte d'Arthur, selections by Alice D. Greenwood with bibliography from the Cambridge History of English Literature. Bryan, Elizabeth J. (1999/1994). "Sir Thomas Malory", Le Morte D'Arthur, p.v. Modern Library. New York. ISBN 0-679-60099-X. ^ Since morte (or mort) is a feminine noun, French would require the article la (i.e., "la mort d'Arthur"). According to Stephen H. A. Shepherd, "Malory frequently misapplies le in titular compounds, perhaps on a simple sonic and gender-neutral analogy with 'the'". Stephen H. A. Shepherd, ed., Le Morte Darthur, by Sir Thomas Malory (New York: W. W. Norton, 2004), 1n. ^ Bryan, Elizabeth J. (1994/1999). "Sir Thomas Malory", Le Morte D'Arthur, p.vii. Modern Library. New York. ISBN 0-679-60099-X. ^ a b c Wight, Colin (2009). "Thomas Malory's 'Le Morte Darthur'". www.bl.uk. ^ McShane, Kara L. (2010). "Malory's Morte d'Arthur". The Rossell Hope Robbins Library at the University of Rochester. Retrieved 3 July 2013. ^ W. F. Oakeshott. "The Text of Malory". Archived from the original on 2008-07-03. Retrieved 2009-01-11. ^ a b Walter F. Oakeshott, "The Finding of the Manuscript," Essays on Malory, ed. J. A. W. Bennett (Oxford: Clarendon, 1963), 1-6. ^ Walter F. Oakeshott, "Caxton and Malory's Morte Darthur," Gutenberg-Jahrbuch (1935), 112-116. ^ William Matthews, The Ill-Framed Knight: A Skeptical Inquiry into the Identity of Sir Thomas Malory (Berkeley, CA: University of California, 1966). ^ The Malory Project (http://www.maloryproject.com), directed by Takako Kato and designed by Nick Hayward. ^ Whetter, K. S. (2017). The Manuscript and Meaning of Malory's Morte Darthur. D. S. Brewer. ^ "Morte d'Arthur." The Cambridge History of English Literature. A.W Ward, A.R Waller. Vol II. Cambridge: A UP, 1933. Print. ^ Scott-Kilvert, Ian. British Writers. Charles Scribners's Sons, New York 1979. ^ For instance, Sir Bleoberis, one of Lancelot's cousins, claims another knight's wife for his own and rides away with her until stopped by Tristan. In another episode, when Tristan defeats Sir Blamore, another knight of the Round Table, Blamore asks Tristan to kill him because he would rather die than have his reputation tarnished by the defeat. ^ Bryan, ed. (1999), p.xviii. ^ Malory, Thomas; Lanier, Sidney; Kappes, Alfred; Charles Scribner's Sons; Rand, Avery & Co (16 October 1880). "The Boy's King Arthur: Sir Thomas Malory's History of King Arthur and His Knights of the Round Table, Edited for Boys" – via Open WorldCat. ^ Malory, Sir Thomas (1 September 1950). Lanier, Sidney (ed.). "King Arthur and His Knights of the Round Table". Grosset & Dunlap – via Amazon. ^ Dover Publications (1972). Beardsley's Illustrations for Le Morte Darthur, Publisher's note & back cover. ^ University, Bangor. "Stories of King Arthur and the Round Table". arthurian-studies.bangor.ac.uk. Retrieved 2018-07-26. ^ bookgroup.info: interview: Castle Freeman. Retrieved 2012-12-17. ^ A Chat With Castle Freeman, Jr. Retrieved 2012-12-17. ^ "Arthur Dies at the End Book Series: Amazon.com". www.amazon.com. Retrieved 2019-01-30.